In the center left of Pluto’s vast heart-shaped feature – informally named “Tombaugh Regio” - lies a vast, craterless plain that appears to be no more than 100 million years old, and is possibly still being shaped by geologic processes. This frozen region is north of Pluto’s icy mountains and has been informally named Sputnik Planum (Sputnik Plain), after Earth’s first artificial satellite. The surface appears to be divided into irregularly-shaped segments that are ringed by narrow troughs. Features that appear to be groups of mounds and fields of small pits are also visible. This image was acquired by the Long Range Reconnaissance Imager (LORRI) on July 14 from a distance of 48,000 miles (77,000 kilometers). Features as small as one-half mile (1 kilometer) across are visible. The blocky appearance of some features is due to compression of the image. This annotated view of a portion of Pluto’s Sputnik Planum (Sputnik Plain), named for Earth’s first artificial satellite, shows an array of enigmatic features. In the latest data from NASA’s New Horizons spacecraft, a new close-up image of Pluto reveals a vast, craterless plain that appears to be no more than 100 million years old, and is possibly still being shaped by geologic processes. This frozen region is north of Pluto’s icy mountains, in the center-left of the heart feature, informally named “Tombaugh Regio” (Tombaugh Region) after Clyde Tombaugh, who discovered Pluto in 1930. This fascinating icy plains region — resembling frozen mud cracks on Earth — has been informally named “Sputnik Planum” (Sputnik Plain) after the Earth’s first artificial satellite. It has a broken surface of irregularly-shaped segments, roughly 12 miles (20 kilometers) across, bordered by what appear to be shallow troughs. Some of these troughs have darker material within them, while others are traced by clumps of hills that appear to rise above the surrounding terrain. Elsewhere, the surface appears to be etched by fields of small pits that may have formed by a process called sublimation, in which ice turns directly from solid to gas, just as dry ice does on Earth. Scientists have two working theories as to how these segments were formed. The irregular shapes may be the result of the contraction of surface materials, similar to what happens when mud dries. Alternatively, they may be a product of convection, similar to wax rising in a lava lamp. On Pluto, convection would occur within a surface layer of frozen carbon monoxide, methane and nitrogen, driven by the scant warmth of Pluto’s interior. 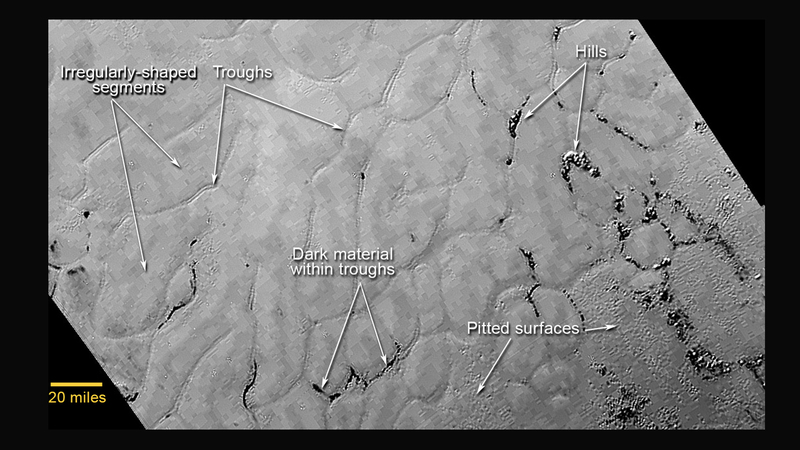 Pluto’s icy plains also display dark streaks that are a few miles long. These streaks appear to be aligned in the same direction and may have been produced by winds blowing across the frozen surface. The Tuesday “heart of the heart” image was taken when New Horizons was 48,000 miles (77,000 kilometers) from Pluto, and shows features as small as one-half mile (1 kilometer) across. Mission scientists will learn more about these mysterious terrains from higher-resolution and stereo images that New Horizons will pull from its digital recorders and send back to Earth during the next year. The New Horizons Atmospheres team observed Pluto’s atmosphere as far as 1,000 miles (1,600 kilometers) above the surface, demonstrating that Pluto’s nitrogen-rich atmosphere is quite extended. This is the first observation of Pluto’s atmosphere at altitudes higher than 170 miles above the surface (270 kilometers). The New Horizons Particles and Plasma team has discovered a region of cold, dense ionized gas tens of thousands of miles beyond Pluto — the planet’s atmosphere being stripped away by the solar wind and lost to space. “This is just a first tantalizing look at Pluto’s plasma environment,” said New Horizons co-investigator Fran Bagenal, University of Colorado, Boulder. In the center left of Pluto’s vast heart-shaped feature – informally named “Tombaugh Regio” - lies a vast, craterless plain that appears to be no more than 100 million years old, and is possibly still being shaped by geologic processes. This frozen region is north of Pluto’s icy mountains and has been informally named Sputnik Planum (Sputnik Plain), after Earth’s first artificial satellite. This simulated flyover of Pluto’s Norgay Montes (Norgay Mountains) and Sputnik Planum (Sputnik Plain) was created from New Horizons closest-approach images. Norgay Montes have been informally named for Tenzing Norgay, one of the first two humans to reach the summit of Mount Everest. Sputnik Planum is informally named for Earth’s first artificial satellite. The images were acquired by the Long Range Reconnaissance Imager (LORRI) on July 14 from a distance of 48,000 miles (77,000 kilometers). Features as small as a half-mile (1 kilometer) across are visible. Alan Stern, New Horizons principal investigator from the Southwest Research Institute (SwRI), Boulder, Colorado, added, “We’ve only scratched the surface of our Pluto exploration, but it already seems clear to me that in the initial reconnaissance of the solar system, the best was saved for last." New Horizons is part of NASA’s New Frontiers Program, managed by the agency’s Marshall Space Flight Center in Huntsville, Alabama. The Johns Hopkins University Applied Physics Laboratory in Laurel, Maryland, designed, built and operates the New Horizons spacecraft and manages the mission for NASA’s Science Mission Directorate. SwRI leads the mission, science team, payload operations and encounter science planning. Follow the New Horizons mission on Twitter and use the hashtag #PlutoFlyby to join the conversation. Live updates are also available on the mission Facebook page.